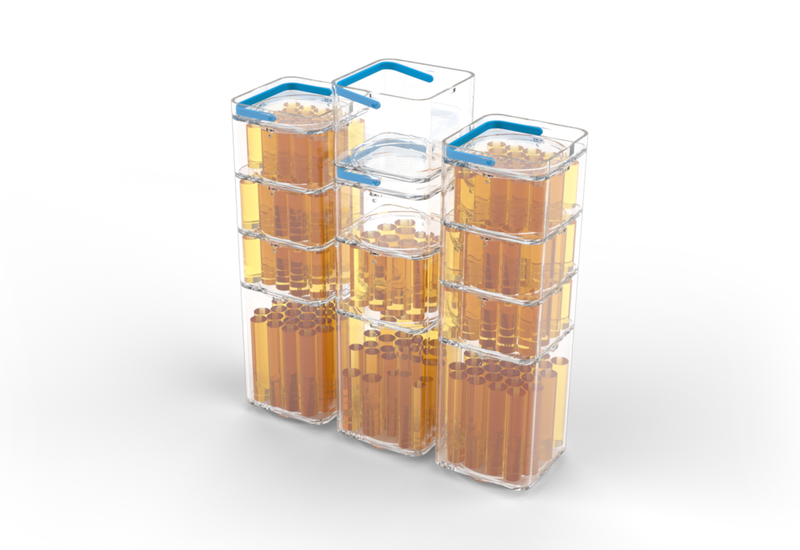 The Arktek passive vaccine storage device is designed to keep vaccines cold for 60 days using only ice blocks. I was the Industrial designer on a team tasked with productizing the engineering prototype. Contributions: Industrial Design, Field Research & Testing, IFU Design. This project had a lot of interesting challenges. It needed to withstand being dropped, dragged, and rolled in harsh environments, but the dewar or vacuum bottle portion was very delicate. We capped the top and bottom in dense protective foam used in car doors, but bulk made it really hard to get a good grip on the device when carried. Cord handles didn't work because of the weight; they would pinch hands against the side of the unit. I invented a design for handles that floated around the foam and didn't transfer the force of the impact to the dewar. This design is used in the production-scale product. I took part in initial field testing in Senegal and Zambia. Stakeholders across the entire cold chain (all individuals and organizations touching vaccines from distribution to field health workers) were interviewed. The Arktek was well recieved but we found room for improvement. For example, it was designed on perfect level floors. When we brought it out to the field, the blocks and stacks where hard to keep in place. As a result we put registration features in the bottom of the dewar and the ice blocks which made operation on uneven floors much easier. The client’s previous prototypes couldn’t store the required quantity of vaccines. I invented a system of of interlocking cups that worked in concert with our team’s super-efficient ice block scheme. Together they made an incredibly dense packing structure that exceeded requirements. The vaccine stack cups come in various sizes to accommodate individual countries' vaccine schedules. Design for repair was always in mind. If a cup breaks, you can replace it with another one from the stack. If a handle breaks, we added features so you can replace it with wire in the field. The ice block caps are threaded to use a 2-liter bottle cap if one gets lost. I designed Instructions For Use to go along with the device that covered all stages of the product's operation, including, transport, prep, operation and cleaning.